Are you searching for an easy yet effective way to make your trade show booth stand out? Stand out in a crowd with a trade show games that feature excitement and audience participation, making a lasting impression about the experience and your company! How Can Game Shows Alive Help Your Trade Booth Stand Out? Trade shows are all about exhibiting the latest products and services that a company has to offer, while allowing industry partners and customers to meet and interact. Open to all members of the public, trade shows allow the prospective customers to learn more about the company and what it has to offer. As the graphic and visual display of your company, your trade show booth is very important. It’s the ideal place to meet prospective clients, trade partners, investors or employees, as well as scoping out the competition and seeing who is offering similar products and services. At trade shows there are copious amounts of trade booths set up, and therefore people are more likely to visit your booth if you offer something that stands out and sets it apart from the many generic, uninteresting booths. There are a few ways you can make your booth stand out, such as training your staff to be interactive and engaging, in order to create a lasting impression. It’s important to provide your audience with enough information about your company, without tipping over into information overload. You want to pique their interest and engage them, without being too aggressive. It’s therefore important that all information shared is concise, easily understandable, interesting, and useful. Contact information should be easily accessible, and creating a hashtag and an influential social media presence can also help set your company apart. However, with so many booths and stalls vying for the attention and interest of passersby, it can be difficult to stand out amongst the information and business oversaturation. That’s where Game Shows Alive comes in. Offering a uniquely different experience for potential customers, your booth is guaranteed to leave a lasting impression. How Do Trade Show Games Work? Having one of our Game Shows at your booth will feature questions about your company, how it works and the products and service that you offer. People love to play games, especially in a context where they are predominantly expected to listen and engage with information that is generally very factual and formal. 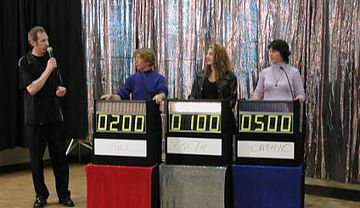 Without taking away from the efficacy of the trade show, incorporating a game show allows people to retain more information while having fun doing it. Your company benefits by having the most popular trade show booth and having your visitors learn about your company, creating awareness of what you have to offer and becoming known for the products and services that you have. Through creating a fast-paced show based on your company’s information, you can give the attendees a chance to hear about your company and what you have to offer. Giving attendees a fun experience will make them more comfortable and spend more time in your booth. Games Shows Alive can be trusted to make your trade show booth stand out through creating a show that will represent your company and will give your very important future customers a positive experience. If you’re looking for a way to stand out from the crowd at your next trade show, don’t hesitate to call us on: 954-282-1803. We can customize your game show to suit your needs and market your company and its products and services exactly as you need. A trade show game is the unique way to create a lasting impression.